This entry was posted in storytelling, writing and tagged adventure, aging well, Alberta, car trips, homecoming, journeys by Margaret French. Bookmark the permalink. Glad you are back in harness. Thanks. I’m glad to be back too. Looking forward to seeing you both. Thanks, Rita. Nice to hear from you. Oh Margaret, how beautiful! What tribute to your mother and to the two of you, undefeatable souls! Hi Sigrid, Thank you. How is it I find myself giving tributes to the woman who often drove me bonkers? Ah, how much you must have in common with that wonderful woman. Full steam ahead and enjoy the good and forget the unpleasant . Enjoyed meetjing your mom through this marvelous trip through your memory. Thouroughly enjoyed this story. I am an old school friend of Shelly’s. I saw this link on facebook. I remember her sharing many fond stories of her Grammie Faye. Just started blogging. Thanks for sharing. Thank you! I’m glad you enjoyed it. My mother was worth a lot of stories. I think she and Shelly shared some special times. What a great story, Margaret.! As you know, I’ve heard it before and loved it but it is even better in the retelling. I’m glad you posted it it and especially that you shared the photo of your indomitable mother. That was such a story and it filled my heart with peace and pleasure. Thanks for sharing. Life seems to be very very busy and I hope that I don’t forget to smell the roses on the way. I loved hearing this story at Word Plays on September 14 and enjoyed reading it here tonight. The picture of your mom with an ice cream cone in each hand is great! 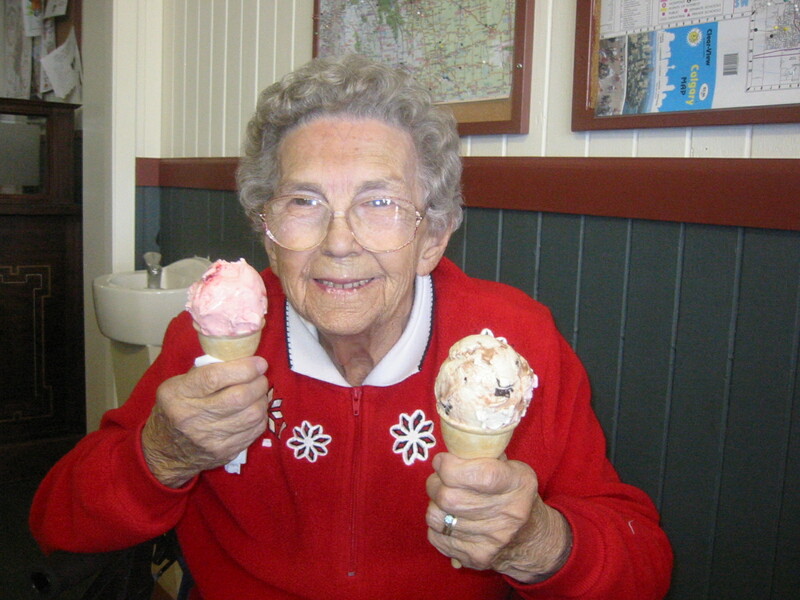 My mom loved ice cream and outings, too. Keep giving us your great mom stories. They are treasures.